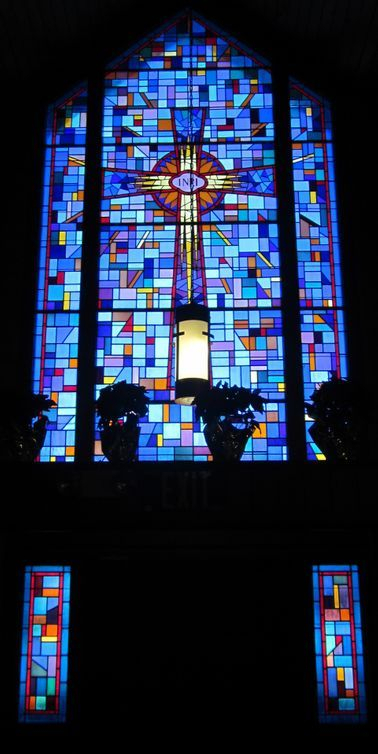 In 1989, Laws Stained Glass Studios installed (13) cathedral glass windows at Congaree Presbyterian Church in Cayce, SC. 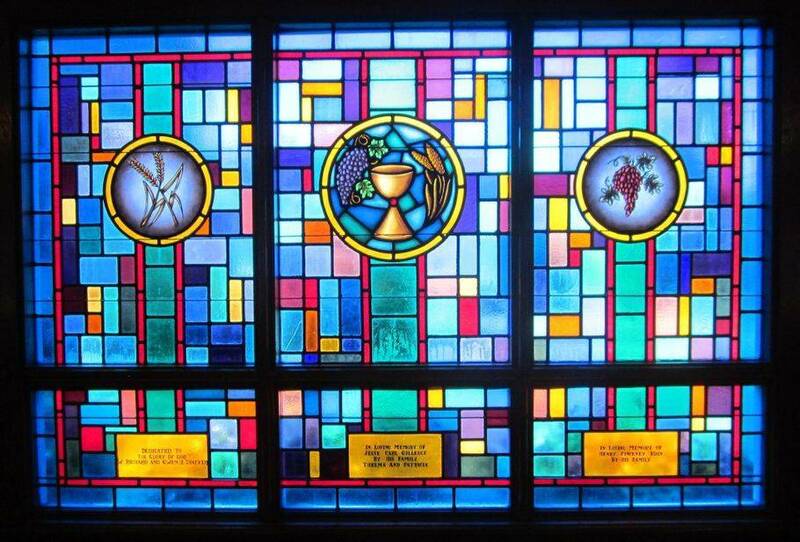 The eight main sanctuary windows (size 90" wide x 59" high) are divided into triple windows with the center section containing an 18" round cut & leaded symbol and the side windows having a 12" round symbol. Three single windows (size 30" wide x 59" high) contain a 12" round symbol. All of these windows have memorial plates. The one large window (108" wide x 252" high with a pointed top) is located above the front doors and contains a large cross design. 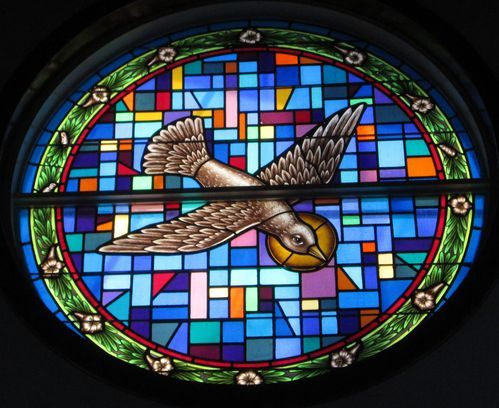 The round window (6 feet in diameter) is located behind the pulpit and contains a dove symbol. Laws began the installation by removing the existing wood sashes. Laws installed the new cathedral glass into the existing wood frame. For the round window, the church made a rough opening in the existing wall and Laws installed an aluminum frame into the resultant brick opening. In 1996, the church ordered two more windows (size 24" wide x 217-1/2" high) with no symbols. They were installed into the existing wood frames like the others. At that time, a few broken pieces of glass were replaced as well. In 2015, Laws returned to Congaree Presbyterian Church to do some repair work. The large window had some bulging in the center sections. Laws removed the six sections in the middle. The sections were straightened and four vertical braces were added to each section. At that time, three broken pieces of glass were replaced as well. Cathedral glass window (a triple window); The center section has an 18" round cut & leaded symbol and the sides have 12" round symbols. At the bottom of each section is a memorial plate in an amber color. View of the large cathedral glass window above the doors with a Celtic cross design. Below that window are two small windows with no artwork.